When folks need the absolute best in professional emergency restoration services, they rely on the mastery and talent of 911 Restoration of East Valley owner Chris Harper, as well as his water damage Mesa crew to take care of them with kid gloves. Our specialists can get straight to the heart of your challenge with technicians who will arrive within 45 minutes to start working. Additionally, Chris’ team is also available 24/7/365 to eliminate water wherever and whenever it springs up. This way no matter what, our experts can get you back on your feet in no time, anytime. If your home or storefront is already dealing with a water invasion, then you need to contact our water extraction team with 911 Restoration of East Valley for immediate aid today! Most people know that water damage is a powerful invading force, and it must be stopped when it wrongfully enters your home or business unexpectedly, but many neglect to realize that water damage also has the overwhelming capacity to induce robust mold growth in the absence of treatment by professionals. Water has a profound capacity to get under cracks and into hard to reach areas, and in many cases, it wicks up into locations that cannot be cleaned with conventional means. 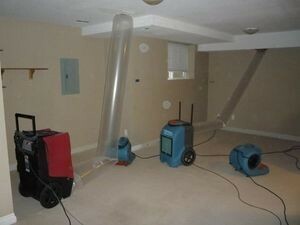 This is why water damage has such a mastery for growing mold when it occurs. Water that invades drywall and escapes below base shoe will undoubtedly cause a fungus infestation to take root without proper drying, and this is why people who have recently been through water invasion emergencies should contact our water damage Mesa experts for help. We know all about mold and its ability to transit a home through the ventilation system or even when a colony growth has been jostled and emits spores into the air. Our technicians are IICRC certified and totally trained in all aspects of mold spore containment and abatement. 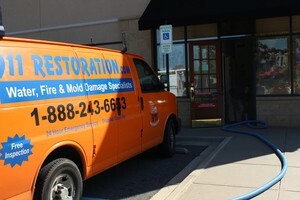 They know all the methods necessary to protect your home from mold invasions, and the water damage that causes them too. Chris and his water damage Mesa specialists know all there is to about how to remediate and rejuvenate a home that has been adversely affected by a water damage invasion, but they are also highly skilled in helping people to avoid such scenarios altogether too. Make sure you check the pipes in your home or business from time to time to see if you spot any rusting or puddling under any sections. If you find any, you may have a section with corrosion that could easily turn into a pipe burst down the road when put under pressure. Take the time to trim all of the trees around your property that threaten to lose branches to high wind or heavy rain. If a dead limb falls onto your roof line at the wrong angle it can impale the protective layers that keep water damage out. Never place anything into your plumbing system that it was not designed to handle as this can be a prime cause for obstructions that then cause toilet overflows and sewage backup calamities. Items that should not be placed into the system include multi-ply, and even those products that claim to be biodegradable too. Inspect the shingles and flashing on your roof for any that are missing or damaged as these might turn into an entry point for rain and other severe weather during monsoon season. If rainwater does enter your home through a missing shingle, then it can flood your attic and cause massive mold growth. Fixing shingles is easy and cost effective, so check your roof today. Make the time to give a once over to your rubber hoses and fittings on the appliances in your home that are linked up to the water line. These can experience wear and tear that may eventually lead to a hose rupture that spreads water damage throughout your home. These tips and tricks are some of the most common in the industry, but there are plenty more that aren’t addressed here, and if anyone has questions about things that aren’t mentioned on this list, then they should feel free to contact Chris and learn all they’d like to about how to prevent water damage in their home or store. If a minor spill occurs in your home, you might attempt to eliminate this on your own, without the aid of a restoration company, and if so, there are some solid measures that you need to take to mitigate the damage, and prevent additional loss through inconsistencies. If you have a minor spill, then the first course of action is to make sure that it doesn’t spread any further into areas that are unprotected, or that are in any way porous in material nature. If water comes into contact with drywall, it will most likely need to be extracted, and it may be best to hire our water damage Mesa professionals for the entirety of this job. If your spill is minor in nature, then after cleaning up the excess water from the incident, the next course of action is to use a cleansing agent to ensure that any residual moisture doesn’t have the opportunity to coax mold growth in any way. Bleach is one of the more common ways to prevent a water damage incident from turning into a mold growth scenario. If you find a leak of any sort in your home or office, it must be solved quickly to prevent mold growth as outlined above. If a leak is not contained it has the profound capacity to get worse due to the influence of pressure in these situations. To avoid a leak from expanding, turn off the water to the local area of the pipe, and if this is not possible, then turn off the water main to your home. If you can’t find the water main to your home, then call our water damage Mesa professionals with our team to come and help out immediately before the situation devolves further. If you have access to a large receptacle of any sort, then try to place this under the outpour of the leak to prevent it from allowing the water into unsecured areas of your home or office. If you don’t have a receptacle as such, then try to direct the flow of the water towards a larger surface area to form a collection that can be more easily extracted by a restoration professional. There are many ways floods can affect a home after they occur, and they are not limited to mold and fungal growth either. An ongoing water damage scenario has the ability to slowly erode the structural capacity of your home or office, and this may undermine its ability to support weight. Additionally, an old water damage event can also lead to rotting of the wood and supports that keep your home safe for you and your loved ones, so if you think you have rotting issues, contact our water damage Mesa team for help today. The water damage restoration process is intricate and varied according to the specifics of each scenario, but rest assured, our water damage Mesa technicians have seen and solved it all in their time and this experience allows them to take on any challenge that they encounter with gusto and fortitude that will ensure your property is well taken care of. The water damage restoration process starts with the extraction of water from the premises of your property, be it an office or a home, our technicians will eliminate the excess, and make sure that there is no standing water which may enable a mold and fungus growth scenario to unfold. After the water has been extracted, 911 Restoration of East Valley will then position air movers, dehumidifiers, and even heating elements to containing, collect, and condense any residual moisture left in the structure. After all of the moisture left in the building has been extracted, our technicians will then begin with the rejuvenation aspect of the restoration process which involves the elimination of soaked drywall and other building materials, and then a rebuilding of the home or office involved. Our experts will be with you every step of the way, walking you through the entire process, so that you feel just as connected to the healing of your home or business as you did with it before any of this ever happened. Our specialists will be there from the elimination of the first drop of water, to the application of the final coat of paint to get your property looking like new again in no time. When it comes to insurance claims and the process needed to achieve coverage for your structure during a water damage incident, there is no one more involved, capable, and experienced than Chris and his water damage Mesa team. Chris knows how mentally taxing these scenarios can be for people, and this is why he offers to fill out and file the insurance paperwork for his clients so that they don’t have too much on their plate at once. Additionally, we will work with all insurance companies to ensure that no matter what the nature of your incident is, it will be taken care of, and the insurance will cover as much as is deserved in all situations. Moreover, if your particular event is not covered by your policy for whatever reason, 911 Restoration of East Valley will work with homeowners and businesses alike to ensure that everyone receives the highest quality work, and for a truly affordable price as well. All homes and businesses encounter different water damage situations, and this is why each incident takes different skills and knowledge to eliminate fastidiously. No matter what though, we have the experience, the training, and the know-how to take on any scenario that they encounter, and then to provide expert level services when they take on a project. Beyond that, our professionals are completely and totally mobilized for all aspects of restoration work and services, and this is why they always bring the latest drying technology and truly innovative extraction equipment. 911 Restoration of East Valley also makes sure to always put the customer first in every situation that we encounter, and with every job they bring an unparalleled level of professionalism that gives all clients total peace of mind. If your home or office location is already underwater, then you need the help of Chris and his water damage Mesa team with 911 Restoration of East Valley to come and take care of everything for you today!